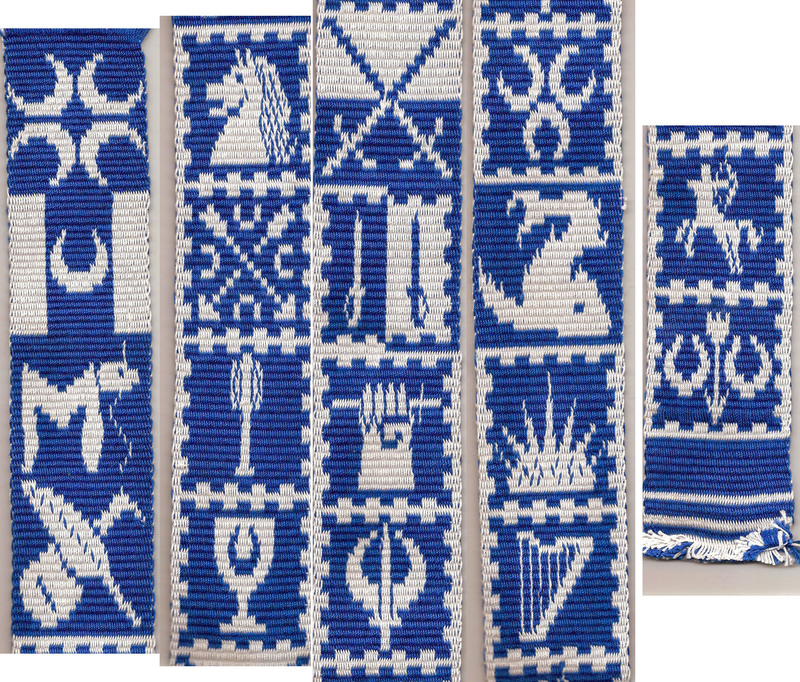 For this second project, I decided to create patterns for the badges of all the armigerous awards in Caid (the Order of the White Scarf has no registered armory), weave a sampler, and present it to Their Majesties. After weaving the nine badges, however, I realized that I had quite a bit of space left over in my warp, so I designed the rest of Caid’s armory that could be woven using this warp (in other words, badges that were exclusively blue and white). This strip took about two weeks’ worth of lunch breaks and some evening work to complete, and I think it turned out beautifully. (Click on the picture below to view a larger version). I presented this sampler to Their Majesties of Caid at Spring Crown on April 12, 2008, along with three hard copies of the patterns. They can be seen individually on this page or downloaded as a .pdf document here.